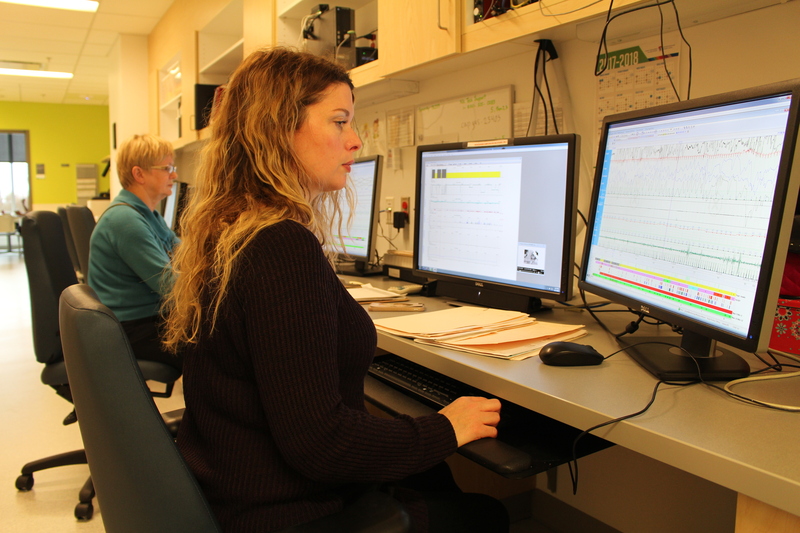 A day (and night) in the life of a…respiratory therapist in the Sleep Lab! 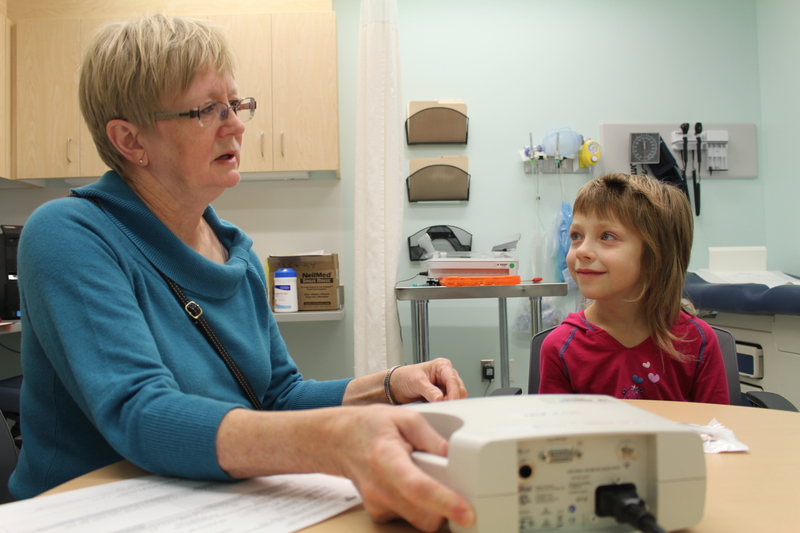 The Montreal Children’s Hospital’s Sleep Laboratory (Sleep Lab) first opened its doors in 1990. They were initially set up in an office space that was converted into a sleep laboratory and only saw one overnight patient a month. Fast-forward 27 years and the Sleep Lab has grown tremendously, both in patient volume and physical space. And, respiratory therapist Sylvia Ladan has been there to see it all. The Pediatric Sleep Lab is divided into day and night activities. 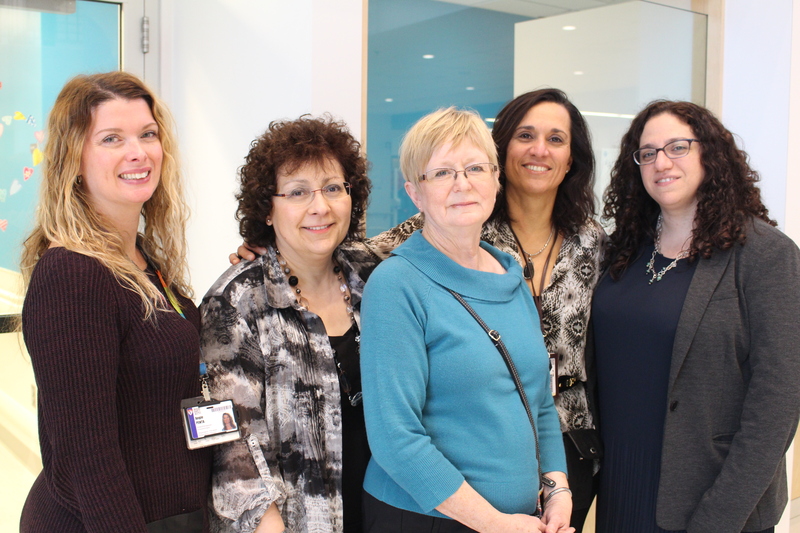 Sylvia works alongside Diana Zinno, Assistant Chief of the Sleep and Pulmonary Function Laboratory for Pediatric Respiratory Services, as well as respiratory therapists, Angie Penta, Isabelle Blanchette, Georgia Kotsirilos, and administrative agent Marisa Campellone. They triage referrals and work with pediatric sleep specialists, Dr. Robert Brouillette and Director of the Pediatric Sleep Laboratory, Dr. Evelyn Constantin. During the daytime, they assess patients who have been referred for suspected obstructive sleep apnea or other sleep disorders. Patients are sent home with an oximeter, a small portable medical device that measures the oxygen level in their blood and heart rate while they sleep. It helps the team rule out obstructive sleep apnea or other breathing issues during sleep. In more serious cases, a patient will be asked to come in for an overnight sleep study in the Sleep Lab. The overnight study is called a Polysomnography test, and is used to diagnose sleep disorders. It measures a child’s brain waves and eye movements, oxygen and carbon dioxide levels, heart rate and breathing, as well as leg movements during sleep. Each study can last between eight to nine hours, and the Sleep Lab can run up to two overnight studies three nights a week. The child’s parent sleeps alongside them in a cot, but the child is observed constantly by a night shift respiratory therapist close-by in the monitoring room. “Our patients usually arrive around 6:30 p.m. and then the respiratory therapist will begin putting the electrodes on,” says Sylvia, who up until recently was working the overnight shift. Over 25 sensors are attached to the patient from head to toe. They attach two respiratory bands across the chest and abdomen to monitor breathing, 13 EEG sensors on the head and face, as well as a snore sensor on the neck to monitor vibrations and a nasal flow sensor. Sylvia says that respiratory therapists who work in the Sleep Lab develop a unique skill for setting up the patients so that they feel comfortable enough to actually fall asleep. 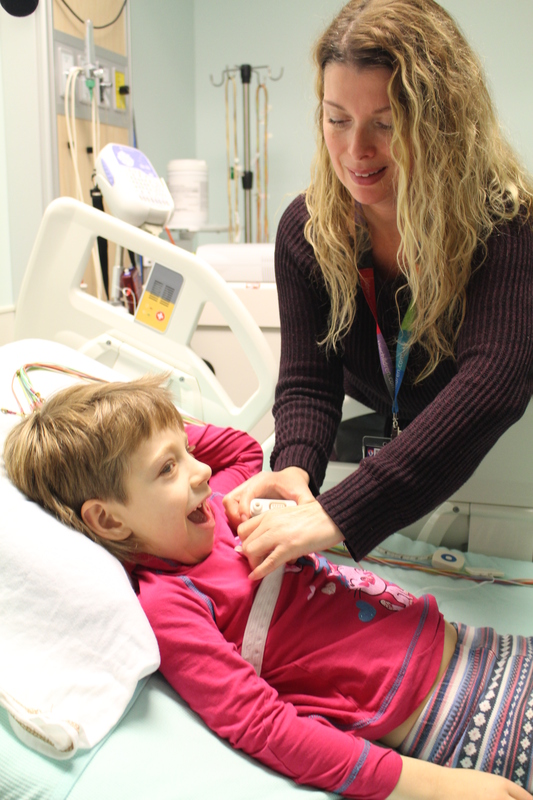 “We put on the sensors while the child is awake, but it can be very difficult in certain situations, especially with younger patients who require more attention,” she says. Some patients come in with existing equipment, like continuous positive airway pressure (CPAP) machines, and the settings of these machines have to be fine-tuned by the respiratory therapist during the night. “We have to be great multi-taskers and technically-savvy,” says Sylvia, who in addition to her Respiratory Therapy degree also acquired extra certification as a Registered Polysomnography Technician. “It’s definitely something you learn on the job and become very good at. We always have one eye on the patient and one eye on the data.” And if the patient is struggling too much to breathe or requires immediate treatment, the physician on-call and the respiratory therapist will arrange for the patient to be sent to the Emergency department or admitted to the hospital for further observation and treatment.